Description: A calming sunset scene from the Algonquin National Park in North East Canada. The relaxing colours in this painting will complement most colour schemes and add an interesting focal point to any room. The painting continues round the edges of the frame so it is ready to hang with no need for framing. This creates a very simple but effective style. This painting has been finished with a protective satin varnish. Delivery Details: UK Mainland postage included in the price. Please contact me for international postage. 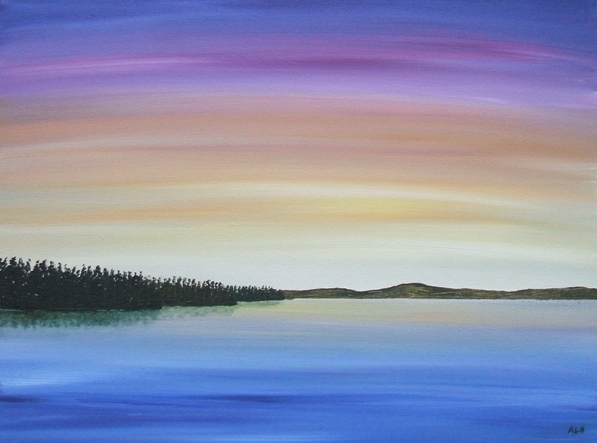 I am a contemporary Artist specialising in colourful sunsets, seascapes, landscapes and abstracts. As a child I grew up living in Hong Kong and my travels around South East Asia provided many opportunities to experience at first hand the richness of the local cultures and the variety of local art and custom. These experiences have undoubtably provided a strong influence on my style. I love working with acrylics and large canvases with the great freedom of expression they allow, and the endless possibilities in depth of colour and texture. The immediacy of seeing my work come to life quickly is another satisfaction. As well as producing original art work, I also build on concepts from previous works to produce new aspects or additional detail. Living in the Berkshire countryside provides many opportunities to take inspiration from the surrounding woodlands and fields with their ever changing colours and variety of shapes throughout the different seasons. Sunsets and lively skies also provide strong influences and in each painting I aim to capture and demonstrate the emotions and experiences that have been drawn upon to shape and develop it. My paintings are distinctive with their strong colours and flowing lines and each one is truly unique. When not painting, I devote much of my spare time developing my artwork, enhancing my skills, learning new techniques and trialling different styles and media.